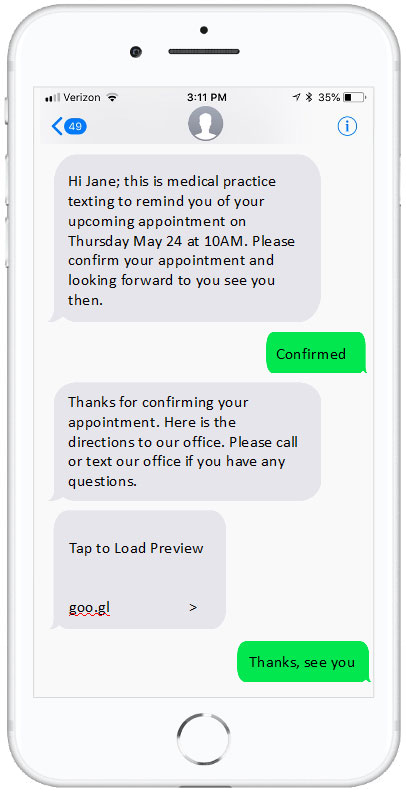 One of the interesting use cases of text messaging for business is to send appointment reminder messages via text. Using our service, the reminder text messages will be sent from your business telephone number. Recipients can easily respond to the message to confirm the appointment or call your business number from the received text to talk to your staff for any reason. Using the intelligent chatbot feature, it’s even possible to train the system to provide further information to the recipient in a conversation format. For example, the system can be trained to converse with the recipient and changed the appointment to a different date, provide office address and directions, etc. After creating a bridge between your scheduling software and our texting platform, updated appointment information will be sent to us frequently. Our reminder system will then send appointment reminder text messages, based on the received appointment data, from your business telephone number. Personalized messages are automatically sent and responses are automatically obtained and recorded with no human intervention. Detailed call/text reporting is available in our web portal few minutes after the reminder campaign is sent.